This security poster illustrates WW2 Axis bar mines Germany/Italy anti-tank mines, the Riegelmine 43, the Italian B2, and the Italian V3. Although these mines are WW2 designs, these German and Italian mines demonstrate the features later much copied for full width bar mines. This security poster features a Riegelmine 43 with a Druckzunder 34 in the top fuze pocket, an exploded Riegelmine 43 with early metal Z.Z.42 fuzes, sectional drawings showing fuzes for pressure and set for anti-lift, an Italian B2, a sectioned B2 showing the safety level in position in the fuze, an Italian V3, and a section of the V3 showing cocking handle, circlip, tension spring, and detonator block. 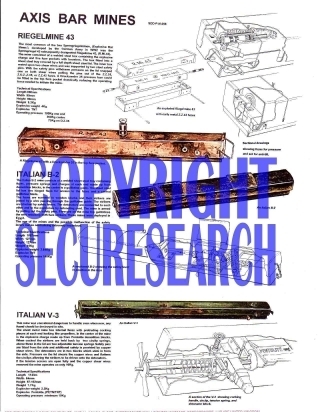 The security poster also shows the technical specifications of the Riegelmine 43, the Italian B2, and the Italian V3, all of which are WW2 Axis Bar Mines Anti-Tank Mines. A Riegelmine 43 with a Druckzunder 34 in the top fuze pocket. An exploded Riegelmine 43 with early metal Z.Z.42 fuzes. Sectional drawings showing fuzes for pressure and set for anti-lift. A sectioned B2 showing the safety level in position in the fuze. A section of the V3 showing cocking handle, circlip, tension spring, and detonator block. The technical specifications of the Riegelmine 43, the Italian B2, and the Italian V3, all of which are WW2 Axis Bar Mines Anti-Tank Mines. This security poster features the technical specifications of the Bar Mines, a Riegelmine 43, an exploded Riegelmine 43, sectional drawings showing fuzes, an Italian B2, a sectioned B2, an Italian V3, and a section of the V3.